As I wrote earlier, my G-Pa was a quiet man and a man of few words, but in no way did this mean he was weak. It was in his quietness that you could see and experience his strength. He was from a generation that was very different from my generation, he didn’t need to hear his own voice, he didn’t need to talk for talking’s sake, he didn’t need to validate his existence by a constant flow of conscience from his mouth but when he spoke it meant something. You can see this strength come through in other traits that I will get to, but it was his quiet strength that he held to, maybe even to a fault, till he passed, as he didn’t want to burden his family with the pain, I think he was going through. We could look at this as a positive and/or a negative, but I, as one who sadly needs to hear his own voice, need to learn this quiet strength and resolve in my own life to a degree. For most of my years on earth, my grandfather was something like a god among men, when it came to his strength. He would wrestle, tickle me, give me horse bites and the like and I had no answer, no comeback, no feat of strength to match his! This lasted even into college, until UW-Oshkosh Football got me in the weight-room day after day, but even then he probably could have taken me in a war of horse bites. I take myself far too serious most of the time, but my G-Pa knew how to laugh and knew how to play. I, as many of the other children, have a fun, playful side that can be traced straight back to my G-Pa. Some of the deepest, heartiest laughing sessions of my life came as a result of the antics of my grandfather. It might have been as the result of a horse bite or something along that or it might have been the subtle little pranks that he would pull. So don’t take yourself too seriously! Give a loved one a horse bite and laugh today! My grandpa was one of the hardest workers I’ve ever known. I can see how his work ethic has worked its way down to my mother and then to her children. I saw my G-Pa’s relentless work ethic not necessarily though his years of work at the Dairies in Huntley, IL, but in his crafts, handiwork and gizmos. The man, with the help of his family, build a cabin up in Wisconsin Dells, he built tree-houses, go-carts, zip lines, can crushers, catapults and the like. He worked his tail off on these things, why? Because he loved it, because he loved us. 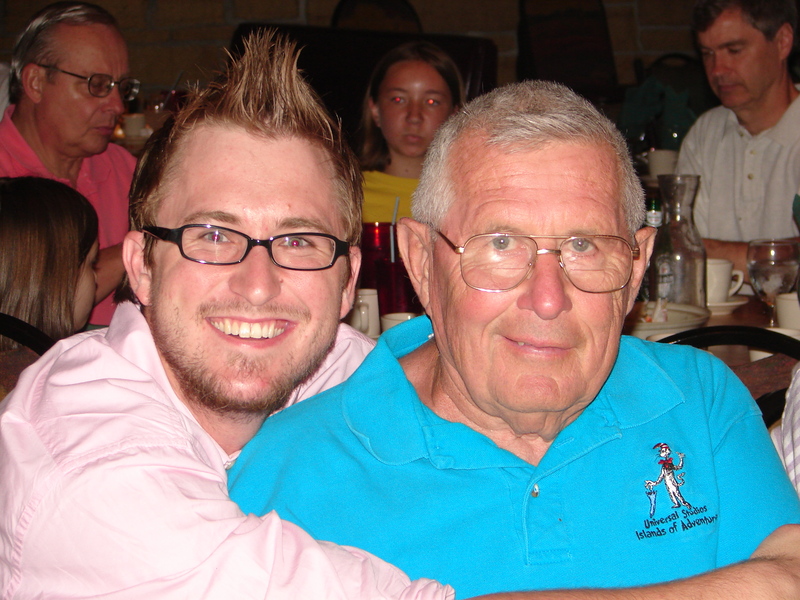 My G-Pa seemed like one of those types of men, who found rest in hardwork, which has surely been passed down to me. Now when I talk to my players about “hardwork” it will be a sort of living memorial to the handwork that I saw my G-Pa live out day after day, year after year up until his knees and hips slowed him down a bit. I’ve noticed an industrious side to my sister, Megan, and I as we have graduated college and have moved into the “working world.” I’m sure my grandfather isn’t the only source of this industrious side, but I can see how it came from him. My G-Pa was a beast of the garage and the work bench! Seriously, he went “beast mode” often! As I said he built a cabin in the Dells, but it didn’t end there. He built me a go-cart for scratch! I don’t mean a kit or something like that, he welded, tinkered and created a red-ripping go-cart from left over parts of miscellaneous items. He did this time and time again, with tree-houses, zip-lines, can crushers, rocket launchers and the list goes on and on. It was perfect for a grandson! I loved it. He enjoyed this of course, but it was part of his life, part of who he was. I think this is why I, and my sister, can visualize something that isn’t and work and create and see it through to fruition. We saw it modeled by our grandfather our whole lives. In the last two years I’ve seen so much unfaithfulness and selfishness, that it makes me sick to think about, but from the 31 years I shared this earth with my G-Pa I saw him model something that isn’t valued or prized in our day – FAITHFULNESS! I learned faithfulness from him, which means the world to me, and has become one of, if the not the most, prized values or characteristics for me and for others as well. If someone is faithful you can count them and the potentialities are endless! My grandpa didn’t teach me this through words, but for his faithful steady love of my Grandma for nearly 60 years, that lasted to last words that he told her, that he told her every night before they went to bed – “I love you dear. Those were the last words my Grandma heard from her husband of nearly 60 years! How amazingly beautiful is that? In those four words are nearly 60 years of faithfulness! Wow! I think it was also fitting that my G-Pa was a marine and held their motto, Semper Fidelis, to heart. Semper Fidelis is Latin for “Always Faithful” or “Always Loyal.” Well said, well said indeed. Here’s an example of a true man. THIS IS MANHOOD. Faithfulness and selflessness modeled for 84 years, 31 of those witnessed by me. This challenges me to strive to be faithful in all I do, in those relationships in my life and even to my God. It challenges me to also strive to be selfless and give more than I receive, and when I have given all I can, to give some more. 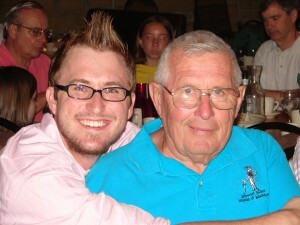 I hope my G-Pa’s example of faithfulness challenges you too! I hope it challenges you and I to fight against the ugly unfaithfulness & selfishness of our world! There you have a few things I learned from my G-Pa. I hope that this post encourages and challenges you to strive for something more in your life, than just the mundane, let life pass us by sort of attitude that many people have these days. As I recently wrote about legacy, I hope to carry on Robert Shisler’s legacy through these values and characteristics he passed down to his kids, grandkids and others. Once more thank you to all of you, who have prayed and sent well wishes to me and my family in this time of mourning. It is very much appreciated. Grace and peace to all of you this Christmas season….